This week something pretty impressive happened that will go down in history: the first commercial flight into space took place. That’s right, a non government body successfully sent a spacecraft into orbit, had it do some task up there and then it returned safely to earth. This space shuttle, created by a private company called SpaceX was unmanned and was one of the first of three test flights of this particular rocket which will eventually dock with a space station and be used to shuttle supplies. The shuttle was created to have human passengers although the first passenger was a single wheel of cheese. In an age where they don’t even televise space launches anymore as they are so frequent, this may not seem that big of a deal but think what this can mean for you or more importantly, your children. With this launch comes the first commercial foray into space flight which opens the doors for private use. For now, these space shuttles are being contracted by NASA to shuttle supplies back and forth the International Space Station, but once manned tests take place and more than one of these is created, we could actually see commercial space travel as a form of recreation. Imagine if you will, “JetBlue Spacelines” and (rich) people giving the gift of space travel to their family and friends around the holidays. We may even see private explorations of the moon which would come with people claiming plots of land on the moon and eventually building structures there for their own use. This may sound completely futuristic, we are living in the future now and while the general public seems disinterested in space travel as it used to be, a bunch of stuffy old men in a big room with computers and coffee communicating to some rocket-jockeys through fuzzy radios, the future of space travel – rather the present of space travel with this commercial launch could be timeshare commercials on late-night television and moonlight vacation packages being raffled at the company Christmas party. When cars were first invented they cost a great deal of money and most people didn’t have them but with Fords assembly line, and the way things were manufactured changing over the years, cars are everywhere and anyone can have one. In the same way, maybe Bill Gates could get a flight on the SpaceX shuttle in the next couple years but for us, the amount of money these flights cost is unfathomable. Eventually the parts for the shuttles will be more readily available, more companies will be manufacturing them and selling them to the companies going into space, competition will take hold and the cost of a shuttle will slowly creep down into reality. As flights come available to the public, just like air travel, the more tickets they sell for a single flight, the more they can spread the cost of that flight and turn a profit. Soon after, imagine seeing a piece on the Consumerist detailing some way that this new Spaceline has wronged a costumer or the backlash to their new policies about carry-on luggage. As far fetched as this sounds I imagine the first private civilian flight into space coming in the next five years as these shuttles are proven safe. What do you think? Would you travel into space to feel the weightlessness or experience the thrill of reentry if the option was available to you? Not far fetched at all. 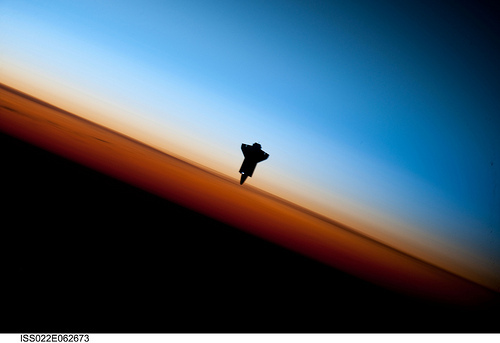 Virgin Galactic spaceline offers sub-orbital travel for a low price of $200,000 beginning 2011. I just hope the TSA doesn’t spoil the party though! Actually, just to throw this out there, Lunar Embassy has been selling plots of land on the moon for years and years now. Google’em. Or don’t, actually, because for now it’s just a waste of twenty bucks. But have to admit, these are exciting times! It would really depend on the price! I’d love to fly in to space on a private aircraft though! Do you have any estimates on how much it would cost? Like Jake said, it would be pretty tough to estimate the price of space travel right now. Though MoneyCone above pointed out that $200,000 will get you a spot on a spacecraft with Virgin Galactica. I wonder if there are any customer reviews you could read…. @Jacob: That would be like estimating the 2015 price of an Intel Core i7 five years ago. All you can really know is that it’ll start out expensive as heck but get cheaper over time. I agree with that! It is tough! That would be quite a journey though! Jake Stichler on Is Auto Assure a Scam? Jake Stichler on Amazon Prime Review – Is It For You?